No need to carry a bunch of tools on your next camping trip – just get the Zippo 4-in-1 Woodsman. 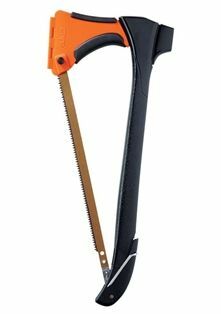 This very practical product has a bow saw that cuts oak up to 4” in diameter, a mallet, a stake puller, and a hatchet with a 5” blade. Surprisingly, no extra tools are needed to convert the Woodsman into each of the four tools. As they so appropriately say, “it’s one tool that lets you leave three others at home”.